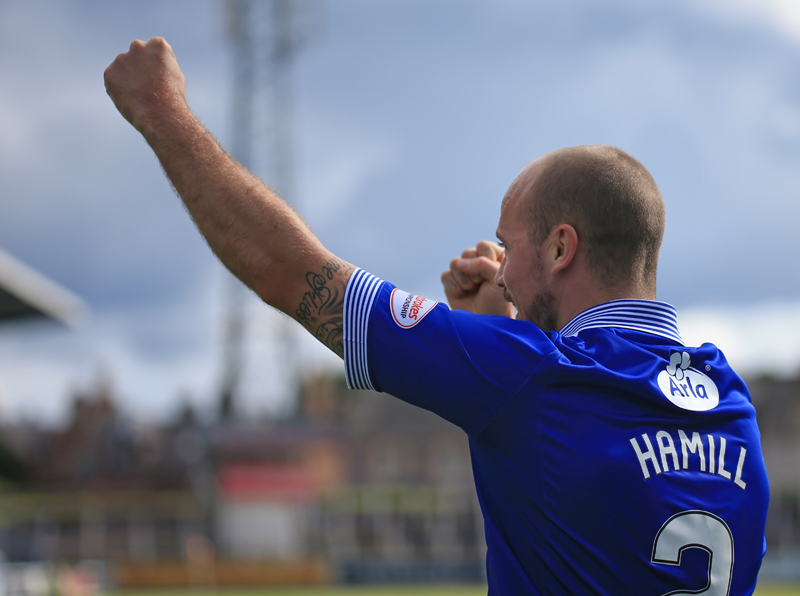 Queens moved through to the knockout stages of the Betfred Cup as a single Jamie Hamill strike was enough to see off plucky Stenhousemuir in the final group game of this seasons competition.The former Kilmarnock man celebrated his 30th birthday yesterday, and today he bagged himself a belated present to give Queens a vital win. After creating, and missing several half chances, Queens hopes of making it through to the next phase was looking slender as the League One side continued to frustrate the home side and their fans,but Hamill`s first goal for the club on 78 minutes proved to be vital as Queens three wins saw them qualify as one of the best placed runners-up. Following last weekends narrow loss, Queens made three changes to the team that started at Firhill. Dale Hilson, and Kyle Jacobs dropped to the bench, whilst Callum Tapping was suspended, so there were starts for Lyndon Dykes, Jake Pickard, and Aidan Smith - the latter making his first start of the season. Goalkeeper Robbie Thomson also returned to the first team squad following injury. 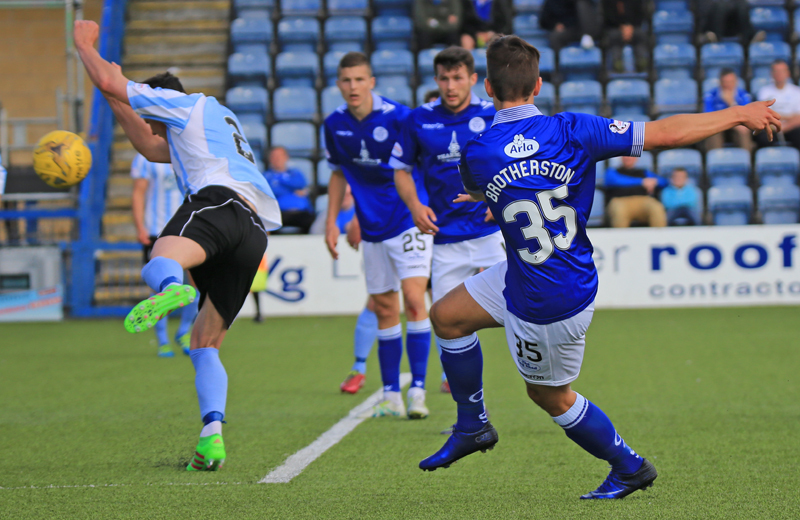 Visitors Stenhousemuir arrived at Palmerston with no chance of progressing in the competition having lost all three of their previous games in the group, and they came close to going behind early in this one as Queens began well. A long ball from Chris Higgins saw Smith break clear of the `Stenny` defence but as `keeper McCabe rushed from his goal, Smith`s hurried attempt went high over the unguarded net. The early signs were promising and when Jake Pickard`s excellent pass found Dykes who in turn found the supporting run of Jordan Marshall, it seemed as though Derek Lyle would move closer to scoring his 100th Queens goal, but from Marshall`s excellent delivery Lyle somehow managed to put the ball high over the bar. Fortunately for the Queens striker, he had strayed a fraction offside and his blushes were spared by the raised flag of the nearside assistant. The visitors responded with an attack of their own, and following the award of a free-kick for a foul by Hamill, former Queens man, Colin McMenamin found space to test Lee Robinson, but his effort was straight at the Queens `keeper. As has been the case in these first few games, Hamill`s delivery from either open play, or from a dead ball situation, has been pretty accurate and on 13 minutes his cross from a free-kick should have led to Queens going ahead. His floated delivery looked to be perfect for Andy Dowie but the defender seemed surprised that the ball reached him and although the ball carried to Grant Anderson he was unable to keep his effort on target.There then followed a spell where neither side looked comfortable with the ball and both sets of players did their level best to see who could give the ball away the quickest, and with several offsides and just as many silly fouls taking place, the sound of referee Graham`s whistle was a constant noise as the game kind of lost it`s way. Midway through the half the visitors were unlucky not to take the lead when a well placed effort from Kieran Miller from the edge of the box, had the beating of Robinson but thankfully from a Queens perspective his shot crashed against the bar, Derek Lyle hobbled away from a challenge on his ankle, and although he continued it did appear that his movement was a bit restricted after the challenge. The pace of Aidan Smith is always going to be an asset for Queens and the youngster got himself into a really good position inside the 6-yard box, but as another Hamill cross was whipped in, he was unable to make any connection with the ball. Moments later Smith was in the action again as he latched on to Lyle`s neat flick to race away down the left channel, but with Anderson in support Smith`s final ball lacked accuracy and the chance had gone. Once again Smith was causing problems for the visitors and after winning yet another free-kick, Queens created another half chance,and again it came courtesy of a Hamill set-piece. This time his clever low driven cross was spilled by `keeper McCabe, but no-one in a Queens shirt could react quickly enough to pounce on the loose ball. It took Queens 32 minutes to win their first corner of the game, and when it came the visitors were able to deal with it quite comfortably as for once the delivery was not accurate enough.They had a chance to address that situation a couple of minutes later as they won corner number two. This time the delivery was perfect but after escaping his marker at the near post, Jake Pickard, got his header all wrong as he screwed his effort wide of the target. As the half moved towards its conclusion a decent effort from Stirling had Robinson sprawling across his goal, and Mark Millar was more than a little fortunate to escape a caution following a hefty challenge on Berry as some signs of frustration began to creep in. The final action of the half saw the first booking of the game, as McMenamin was late with a challenge on Marshall - whether or not the caution was for the foul or for dissent I`m not sure- but it seemed to be no worse than Millar`s was minutes earlier. After what was a pretty average first 45 minutes, the crowd of 1013 would have expected to see a much improved game in the second period, and 45 seconds after the re-start they did at last see the ball enter the back of the net, however the joy was short lived as the effort was ruled out for offside which was a shame as the build up was a nice move.There was a bit more urgency to Queens play in the early part of the half, with both Millar and Hamill using the ball well although the visitors nearly profited from some slack play in midfield and might have set up a sterner test had Cook shown more composure. The injury to Derek Lyle`s ankle in the first half seemed to hinder him and another challenge on him early in the half saw him unable to carry on and he was replaced by Dale Hilson. With Smith, and now Hilson operating as the two strikers, Queens had to continue with a more direct style of play with plenty of early ,long balls being played in an effort to get in behind the visitors defence, but for a long period too many passes were either inaccurate or over hit and as such there was little cohesion to the Queens attacking play. However a swift attack that was started by a delightful pass from Pickard brought about strong claims for a Queens penalty. Hilson got on the end of Pickard`s pass and after sprinting past the full-back his cross looked for the run of Smith who seemed to have been nudged off the ball as he took aim - unfortunately nothing doing as far as the officials were concerned. Queens next attack came down the left and after Anderson showed good pace to skip past Meechan his cross found the unmarked Hilson who got his feet in a tangle and shot wide.It was starting to look as though it was going to be one of those days, needing to win, and probably by a few goals to be sure of progressing, the home side were becoming more and more frustrated as the game went on and composure was slowly disappearing.The visitors with only pride to play for were making life difficult for Queens and it might have got worse when McMenamin found himself unmarked 8-yards out, but his header was straight at Robinson - either side of the Queens `keeper and it would have been one-nil. Manager Gavin Skelton turned to the bench for the second time sending on young Dean Brotherston to replace Aidan Smith, and pushing Lyndon Dykes upfront to partner Hilson. A foul on Millar just outside the penalty box offered a shooting opportunity, and with Marshall and Hilson in attendance it was Hilson who took on the shot crashing his drive into the wall. With the prospect of a penalty shoot out looming and going out of the League Cup so early a real possibility, Queens were looking for a moment of luck or inspiration and on 78 minutes they got both.The ball was worked out to Jamie Hamill on the right and his low driven cross-come shot was palmed into the net by `keeper McCabe who couldn`t keep the ball out. 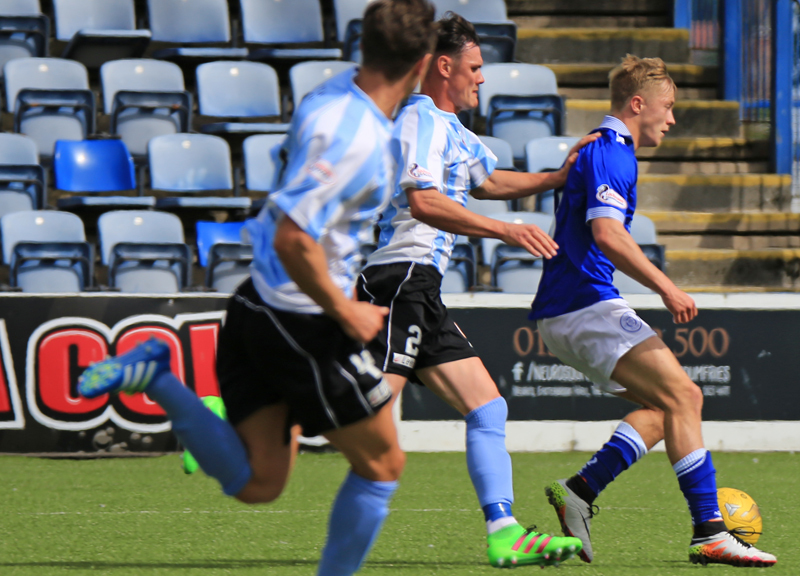 It was a fitting reward for the former Kilmarnock man who was certainly one of Queens` better players on the day, and in fact has had a very good start to his Queens career so far. 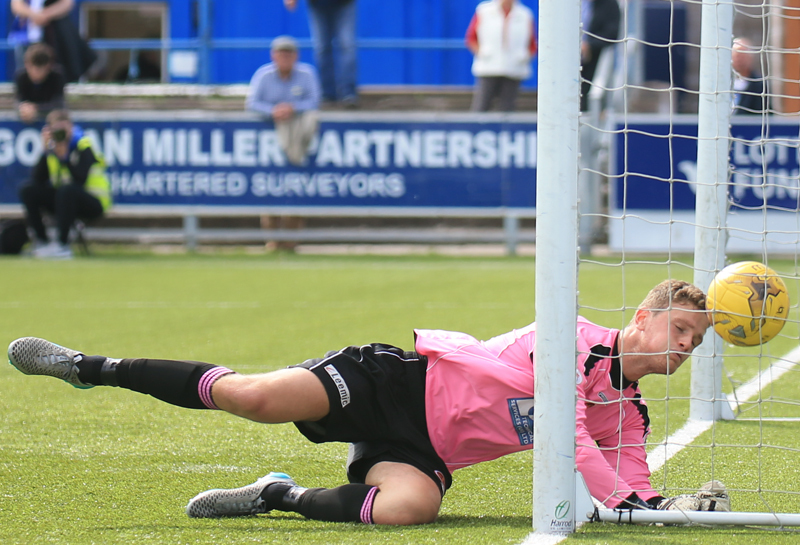 During the final part of the game Queens could easily have made the result more comfortable.Substitute Brotherston went close with a header and then had a shot deflected for a corner, and Hamill went close to scoring again,after collecting a fine pass from Andy Dowie, but this time from a more conventional effort `keeper McCabe did well to push his effort clear. So a far from convincing performance from Queens in this one, but three wins from four group games is enough to see progression into the knockout stage of the competition, and that at the outset would have been the goal. 14:42 Stenny; McCabe, McCormack, Hamilton, Meechan, Kerr, Berry, Gilhaney, Stirling, McMenamin, Millar, Cook. 14:43 Subs; Howarth, McRoary, McMaster, Runciman, Nash, Smith, Docherty. 5 min Marshall curls in a cross to Lyle but the hitman blasts over the bar. 7 min Stirling`s shot is easily saved by Robinson. 14 min The visitors come close to open the scoring but McMenamin`s effort is inches wide. 21 min Millar unleashes a terrific effort off the bar. Let off for Queens. Still 0-0. 27 min Hamill whips in an tasty ball into the box but Smith can`t get the all important touch.Still 0-0. 28 min Lyle plays a through ball to Smith but takes a touch too many and the ball goes out for a goal-kick. 29 min Hamill`s low free-kick is palmed away by McCabe. 30 min Another Hamill free-kick finds Lyle but his effort is blocked. 34 min Another Hamill set-piece finds Pickard but the youngster`s header goes over the bar. 36 min Lyle clears only as far to Stirling but his effort goes wide. 39 min Stirling tries another long-range effort but is wide. 41 min McMenamin cautioned for dissent. 48 min Chance for the visitors. Cook latches onto a Gilhaney ball but the winger`s shot is straight at Robinson. 61 min Hilson squares the ball to Smith but before the striker can make contact he is brought down by a defender but no penalty given. Still 0-0. 65 min Cook scoops his effort wide of Robinson`s goal. Still 0-0. 72 min Berry knocks the ball over and McMenamin heads straight into the hands of Robinson. Still 0-0. 77 min Hilson holds off Hamilton and gets a shot away but keeper McCabe easily saves. 79 min Hamill`s cross-come-shot beats McCabe at his front post. 1-0 Queens. 80 min Queens nearly double their lead as Brotherston drags a header wide. 85 min Brotherston`s powerful strike is deflected out for a corner. 16:51 Queens win 1-0 against Stenhousemuir thanks to a Jamie Hamill goal and are through to the next round of the League Cup.